Ecalpemos: Is the Apha Course Asking the Wrong Question? I have noticed this banner like this outside two churches (one in Kirkliston and one in Edinburgh). 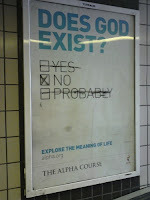 Both are advertising the Alpha Course, but they also say something about how the Church views outsiders. The Church's view of God is very fixed and it seems to be asking people to agree or disagree with it. By asking "Does God exist?" this campaign is targeting people who already have a similar view of God to the people in the church in an attempt to get them into the church and get some bums on seats. This approach is not likely to engage with someone from a different cultural background (like Hinduism, Buddhism or new age spirituality) who has a totally different idea of divinity - or indeed anyone who is a thinker and has bigger questions. 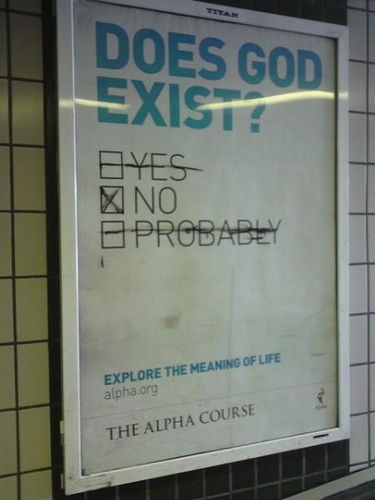 For me the question should not be "Does god exist?" but "What is God? ", and if he, she or it does exist: does it matter?